What can you say about Elder that hasn’t been said already? The astonishingly astute, yet frighteningly youthful Massachusetts three-piece have taken the stoner rock world by storm since the 2008 release of their bone-chundering self-titled debut, followed up by that cosmic vortex otherwise known as ‘Dead Roots Stirring’. Single-handedly rewriting the rulebook of what it means to play great psych rock, with solos, fills, riffs and tantalising melodies all woven into a tapestry of shimmering rhythm, Elder have somehow long eluded their burgeoning European fanbase. That all changed this year with Walter, Jurgen and the Roadburn gang finally tempting Nick DiSalvo (guitar/vocals), Jack Donovan (bass) and Matt Couto (drums) all the way over from New England to help us suckle at the teat of psychedelia; playing live in the flesh for a privileged few on April 20th 2013 in Tilburg and now perfectly mixed and mastered on record for us all by sound technician Marcel van de Vondervoort. Not being there at the Het Patronaat venue myself that night, I’ll have to make do with my copy of the digi download coupled with my memories of their barn-storming show at The Black Heart, Camden just two days later which thankfully featured the same set. That said, Roadburn is and always will be just that little bit extra special and as DiSalvo warmly greets a crowd packed to the rafters before launching into ‘Gemini’ gigantic lead riff, the lyric “I’m coming home, It’s been so long” feels strangely apt. Yes, the levels do take a minute or two to equalise out into a perfect match-up between sheer hard rocking power and delicate, otherworldly, cosmic finesse, but the band’s grace and togetherness hits almost immediately as each 10-minute song zephyrs past in what feels like a mere few seconds. There’s simply only one way to end proceedings and that’s with a slice of pure unadulterated rifforama in the form of ‘Riddle Of Steel Pt.1‘ from the self-titled, which sends the audience into a delirious mosh-mode with beers and grins lofted into the air. There’s simply no stopping DiSalvo’s pummelling guitar, errr… salvos from firing right out from the Matt Pike Textbook of the Riff as Donovan and Couto stomp away hungrily behind him – each chained into the groove of the ride. In a way, it’s understandable that Elder have in the main distanced themselves from their earlier material over the past couple of years in favour of the proggier side of their song-writing approach, but yet it’s still utterly triumphant to hear them rock their Boston Riff Sox off one more time. Already free to download from Bandcamp and with a no-doubt gorgeously packaged CD and LP to appear in the New Year, this is both a must for existing fans and a good place to pick up the band’s sound from scratch for the as-yet un-initiated. Where Elder will go next, no-one really knows. 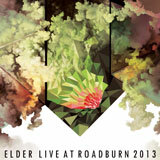 One thing’s for sure, ‘Live At Roadburn 2013’ has superbly captured them at the peak of their root-stirring powers in the home of the mighty.